We all know that time flies when you’re having fun, but as Molly stated, “time is just different at Alzar.” When students arrive on the Alzar School campus, it can often feel like a whirlwind — running between classes, a quick transition into daily activities, learning to put on wet neoprene, pack a backpack and rig a raft as quick as possible are all part of our daily schedule. Not surprisingly, students often struggle when learning how to manage our fast-paced life here, they struggle until they realize the lessons that a full day has to offer. When returning from spring break students were asked to write a leadership journal entry about any changes that they witnessed in themselves over their break. Many answers I had expected. Kassia said “I accidentally waggled my hand when my friend said something that I agreed with,” or, “I asked my parents what the ration for food was, like we were on expedition,” mentioned Grace. What surprised me was not how Alzar-isms had infiltrated students’ lives, but instead how some had a new appreciation for time. Many students spoke to the fact that when home, they realized how little they put into their days after living a “full life” here at Alzar School. They recognized that they could do so much more with their day and when giving the opportunity they were often not optimizing on all the experiences that one day can hold. These quotes sparked interest in my mind, so I dug a little deeper. 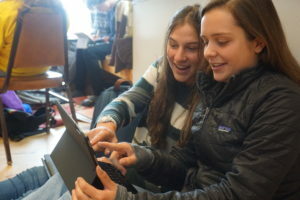 Dylan and Emily collaborate over an assignment. It is quotes like these that remind me that the experiences of an Alzar School semester are not just about living among friends and traveling through the wilderness. Alzar School is about how to be the best version of ourselves – filling our days to the brim with the things that help us lead happy, healthy, and meaningful lives.